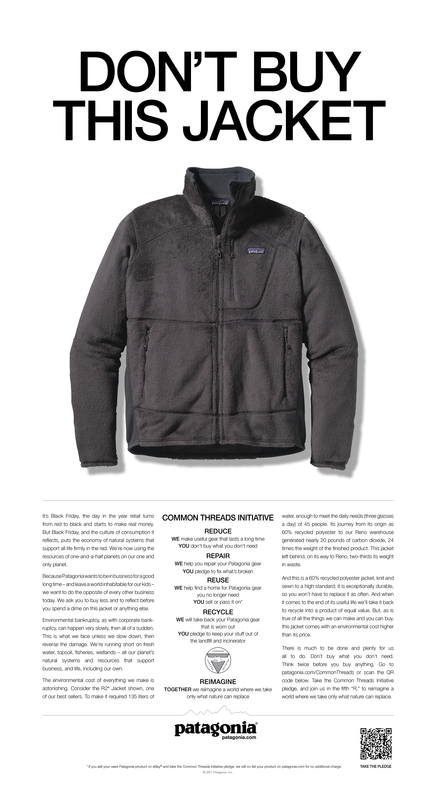 JP: In the same way, I do not need really need a fleece sweater that has been tested in Himalayas, is made from recycled PET bottles and makes me pledge that I will never throw it away but rather repair it or hand it back to Patagonia to be recycled again (click picture of the ad for details). But I do want to financially contribute to- and show my support for an idea about ‘going out and exploring nature while trying not to destroy it’. In that way, I am not just buying a garment when I choose Patagonia, but I am buying INTO an ideology that its bigger than the physical good and than me … and that I am willing to pay a premium for. And Here is Our Video – ‘Smarty Pants’, aren’t we? And if you want help in elevating your own brand to Ueber-Brand status, then contact us. Making brands peerless, priceless and profitable is what we do. A detailed case study and blog post on the brand in our book and across various media. Gallery | This entry was posted in 1 - Mission Incomparable - The first rule is to make your own, 2 - Longing vs Belonging - The challenge is both, 3 - From Myth to Meaning - The best way up is to go deep, 4 - Behold! - The product as manifestation, 5 - Living the Dream - The bubble shall never burst, B - Ueber-Brands and tagged beyond compare, Design Target, digital marketing, Gestalt, Harley Davidson, Hermes, Patagonia, petit H, social dimension. Bookmark the permalink.